Give Big Daddy a hug! The Big Daddies are getting soft and squishy! Big Daddy plush inspired by the BioShock video game series! the cuddly mutant measures about 17-inches tall, 12-inches when sitting. The Big Daddies are getting soft and squishy! 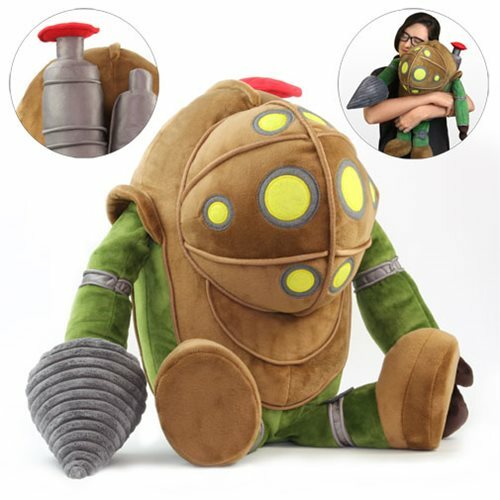 The proof is right here in this BioShock Big Daddy Plush inspired by the BioShock first-person shooter video game series. Made of an ultra-soft combination of velboa, tricot, and felt material, the cuddly mutant measures about 17-inches tall, 12-inches when sitting. Ages 14 and up.